Between 23 and 30 November the operations team at ESOC will conduct manoeuvres to raise the pericentre of the Venus Express (VEX) orbit again, in an effort to keep the spacecraft in productive orbit around Venus. These manoeuvres could be the last for VEX due to low propellant levels, but all being well, VEX will continue its valuable scientific observations into 2015. The question is: how much longer can the spacecraft operate? 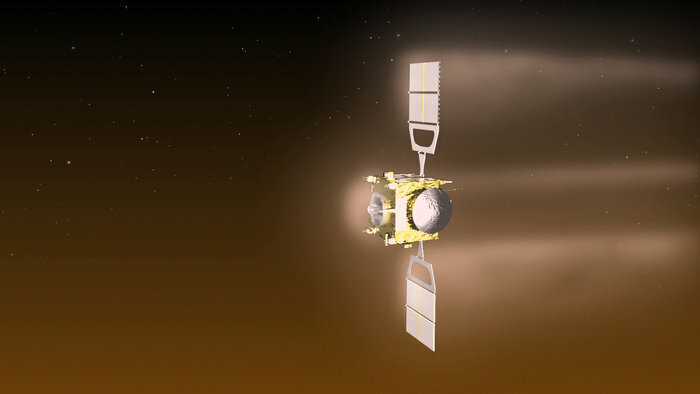 Venus Express has been in a reduced science phase since its orbit was changed following the hugely successful aerobraking campaign during the summer of 2014. The mission, originally planned for two-plus-two (two years nominal operation with a two-year extension) years, has been successfully collecting critical science data from the ‘Morning Star’ for over eight years now. “This has been a fantastic mission and a great achievement for science over the last eight years and Venus Express continues to return excellent scientific data,” states Håkan Svedhem, Venus Express Project Scientist. Due to a combination of effects from the gravity of Venus and our Sun, VEX’s closest point of approach, the pericentre, is constantly descending closer to Venus. This ‘decay’ of the pericentre altitude would eventually damage the spacecraft (due to drag) if it is not raised away from the atmosphere. The OCMs taking place now are using the spacecraft’s thrusters to lift the satellite at controlled increments back to a safer orbit. Without them, the pericentre altitude falls around 3 to 5 km per day. As a result of the successful aerobraking manoeuvres earlier this year, the nominal 24-hr orbital period has been reduced to just over 22 hrs. 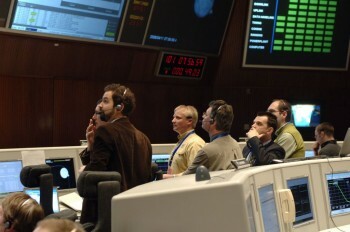 Given that the routine flight control procedures followed for the last eight years – science planning, observations, ground station passes, reaction wheel offloading – were designed for a 24-hr orbit, the change of orbital period by nearly two hours has affected many aspects of planning and operations for the flight control team. “It’s increasingly demanding to fly the spacecraft during this reduced science phase due to the changed orbit,” says Adam Williams, acting Spacecraft Operations Manager of Venus Express at ESOC. The OCMs scheduled for this month will correct the natural decay that has occurred since the PRM (pericentre raising manoeuvres) conducted in July, after the aerobraking activity. “Aerobraking was very successful in July. It’s a credit to the designers that we have such a robust spacecraft capable of these demanding manoeuvres, and to the operators that they have kept it working so well. The mission has continued for much longer than its planned nominal lifetime and will likely continue even further,” explains Patrick Martin, Venus Express Mission Manager. Adding to the challenge, the team won’t know if each manoeuvre has been successful until the following day’s communications pass. In one case, they will have to wait two days for their telemetry to return due to ground station availability constraints. How much fuel do we have? Everything now hangs on the amount of fuel and oxidiser on board the spacecraft. It is calculated that there is around 3 kg of fuel and 5 kg of oxidiser remaining, although some of this may not be usable due to movement of propellant in the tanks. Estimates indicate around 1.4 kg of fuel and 2 kg of oxidiser are needed for the manoeuvres. However, it’s impossible to be certain just how much propellant is actually available and the mission’s continuation into 2015 has been approved on the assumption that propellant remains available. Whatever happens, once the fuel is exhausted, this hugely successful mission will come to a natural end. The Venus Express mission has observed Venus for over eight years and returned startling and amazing data from Earth’s nearest planetary neighbour. Observations have focused on the structure, dynamics, composition and chemistry of the dense atmosphere and overlying clouds. VEX also investigated the swirling vortex at the planet’s south pole. VEX discovered Venus’ surprisingly cold region high in the planet’s atmosphere, and the high-altitude ozone layer. The mission confirmed that Venus is losing water from its upper atmosphere and that it may have been much more humid and Earth-like. Some observations of the surface terrain were possible with the Visible and Infrared Thermal Imaging Spectrometer (VIRTIS). The data provide the best evidence to date that Venus has been volcanically active in recent geological times. In the upper atmosphere, large variations of sulphur dioxide have been discovered. Access more information on the discoveries of the mission here. VEX continues going strong, generating valuable scientific data, and is expected to continue to do so in robust health into 2015. The satellite itself is in excellent condition, as are all its functional instruments. “It is a bit sad to know that sooner or later the spacecraft will run out of propellant,” says ESA’s Andrea Accomazzo, Head of the Solar and Planetary Missions Division at ESOC and the first Venus Express Spacecraft Operations Manager. “Venus Express is, after Rosetta and Mars Express, the most recently launched of ESA’s interplanetary jewels. It was supposed to be a short mission, but the robustness of the spacecraft and the skills of our operations and flight dynamics teams have made it a much longer lasting, incredibly successful mission,” says Paolo Ferri, Head of Mission Operations. Hi! Question…Is it possible , And/Or feasible to place The Sat in A Neutral Position?